Brighten and Bring Life to a Dull Complexion! We know how much the look of your skin can affect you and your confidence. The benefits of a clear complexion include buckets full of confidence when you’re not wearing make-up and the knowledge that your skin is healthy and clear. 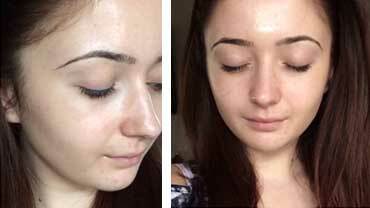 Do you have unwanted spots or suffer from break outs? If you do, try not to pick or squeeze them! Squeezing spots can cause inflammation and lead to scarring. Spots will eventually go away naturally but they may leave behind redness that can last in the skin for some weeks or months afterwards. You don’t want to prolong the healing process and encourage them to come back by squeezing them! 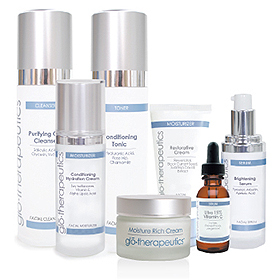 We use Glo-Therapeutics skin care products with our facials as they have been specifically designed to treat multiple skin conditions, such as hyper pigmentation, sun damaged skin, rosacea, acne prone skin, deep lines and wrinkles, and prevent the condition from returning. All of the products we use for our facial treatments are pharmaceutical grade and contain natural fruit acids with high levels of anti-oxidising ingredients. These ingredients give you added benefits; they help to slow down the ageing process of your skin and stop bacteria and oils from building up. When it comes to acne and spots, there are a lot of myths about the causes, and why we get them. 2. Bad personal hygiene: Some people believe that acne is caused by bad personal hygiene but if you are going to get acne, you will get it no matter how much you clean your skin. In fact, too much cleaning may make the condition worse by removing protective oils from your skin! 3. Wearing make-up: There’s also a myth that wearing make-up can cause spots, but again, there is no evidence that this is the case. The less you touch your skin, the fewer bacteria will be spread to your skin. If you wear make-up, wash your hands before putting your make-up on and always remove it before going to bed, there’s no reason why your spots or acne are caused by make-up. The types of facials we have on offer are great treatments for acne. They’re also a great anti-aging treatment and help to promote a clear complexion, reduce skin pigmentation and completely rejuvenate your skin. Before any facial treatment our skin specialist always conducts a skin analysis. This skin analysis helps determine your skin type and the best skin care product to treat your skin condition. Although acne usually goes away by itself, having regular skin treatments can help control your breakouts and clear acne up faster. Contact us to book your free skin analysis.